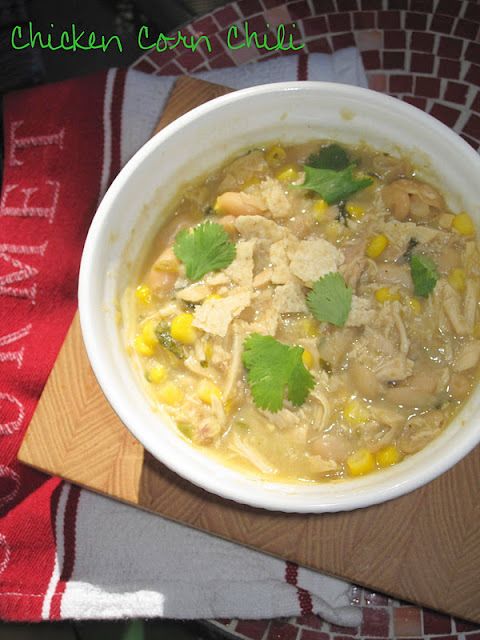 Whenever I saw recipes for white chicken chili on other blogs I always thought that sounded weird. I am from Texas. The home of amazing and authentic chili. And as my father would say, "Real chili is only meat and nothing else, especially not beans." Most people consider chili made with ground beef or my dad does a special mix of ground chuck and ground pork. So although you can call this is a chili I think of it more as a thick soup. Last week I went to Costco and I bought one of the rotisserie chickens with the specific intention of using leftover chicken for something delicious. I found this recipe in last month's Food Network Magazine, which I am slightly obsessed with as of late. They had a ton of great soups that I will be sharing for this lovely Fall season. Did I mention I was also motivated by my recent birthday present? I finally have a dutch oven, perfect for soups! You can buy a similar one here, although mine is a knock off from HEB. Start by pre-chopping all of your ingredients: onions, cilantro, jalapeno and shred your chicken. Then heat olive oil and then add chopped jalapeno, onion, garlic and green chilis and cumin. Then add chicken broth, chicken and beans and bring to a boil, then simmer for 15 minutes so it can thicken. Mash up the chili a little before adding the corn, cilantro and cheese. That's it! So easy and a really really yummy fall soup in under 30 minutes. Heat olive oil in large pot over medium heat. Add onion and cook until soft, about 3 minutes. Add chopped jalapeño, garlic and green chiles and cumin and cook about 2 minutes. Stir in chicken broth, chicken and beans along with liquid from one of the cans. Bring to a boil and then reduce the heat to medium low and simmer, stirring occasionally until thickened, about 15 minutes. Using a potato masher or fork, mash the chili until about half of the beans are broken up. Stir in corn, cilantro and 1/2 cup cheese. Top with remaining cheese and sour cream if desired.